This is tip for how to stop frequent attempts by spammers to post a spam comment to specific blog posts on a Blogger blog. What this post addresses is the utter tedium of having to keep reviewing and moderating spam comments! I noticed that very many of these spam comments tended to arise on the same blog posts. I've published 3,220 to date but it's only a few which attract spam comments. The trigger seems to be if you use a particular keywords that people want to get links for AND that post has been popular AND it has had a lot of traffic. The saddos who don't realise that all Blogger comments are automatically "no follow" (i.e. they cannot add weight to somebody else's website) all target these posts - which is why I ended up moderating endless spam comments each day. I got so frustrated at one point with the endless stream that I needed to review that I just turned off ALL comments by anybody at all. That was before I found out how to switch off comments for specific blog posts. All you need to do is change on setting for individual blog posts. This is my choices under the Options menu on the right side of a blog post window. 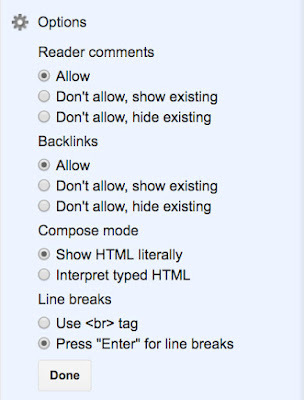 (That's the one at the bottom - underneath the bit where you insert the "search description"
In order to stop spammer comments on specific posts you need to change the option for Reader comments so it looks like this (see below). In other words, you don't allow any more comments at all on that post - but you do allow your existing moderated comments to continue to appear. I also include a comment before I make the change stating "COMMENTS ON THIS BLOG POST HAVE BEEN SWITCHED OFF DUE TO ABUSE BY SPAMMERS". It's not obvious that the commenting function has been switched off for that post - until you click comments and try to post one. What happens now is if I get a spam comment, I look at the blog post and try and recall whether it's attracted other spam comments in the past. 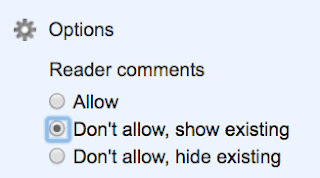 If it has then I go to the blog post and change the comment settings for that one specific post to "Don't allow". That way there will be no more spam comments generated by that post. The new strategy seems to be working so far. Spam comments are much reduced. How are you posting on bloggers days, the ap does not allow me to post . You can post if you are allowed to post. Your comment published - but you wouldn't be able to comment on a blog post where I've stopped further comments.